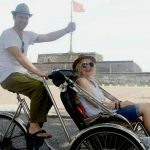 Cyclo is one of the most typical vehicles that tourists often see when they travel to Vietnam. 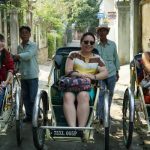 Hue cyclo tour was organized to bring you a new and interesting experience when sitting on this special vehicle and going through the city streets. 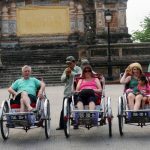 Besides, this tour also helps you have a chance to explore the famous tourist destinations in Hue such as the Citadel and Dong Ba market and watch the daily life of local people. 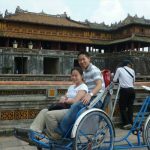 Surely, Hue cyclo tour will bring you unforgettable memories. 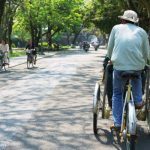 Your guide and cyclo will pick you up at your hotel/stay in Hue City Centre. 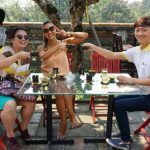 And then go through some streets to the Imperial Citadel – The home of Vietnam’s last royal dynasty- the Nguyen Dynasty. Continue to visit The royal Antiques Museum: A gallery of antiques displaying a collection of bronze pottery, Chinaware, Phap Lam enamel, court robes, head- gear and personal belongings of former Vietnam Emperors of Nguyen Dynasty. 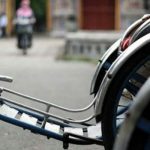 You again sit on your cyclo to visit Dong Ba Market – The biggest commercial center of Hue city. All of the most special cultural gifts and souvenirs can be found in Dong Ba market. Finish tour. Cyclo will bring you back to your hotel/stay. Kids from 11 years old and older: as adults.